In Part II: The Consequences of American Autarky, we discuss this and other ramifications of America’s rising autarky. It would be nice to know about how much auto fuel would be allocated to each U.S. family should we be forced one day to rely solely on domestic oil production. Should the dollar (I should say when) lose its reserve currency status, that question will take on increased importance. The federal government will allocate whatever it needs to itself, of course, with a generous margin of error. Then, state and local authorities will be next in line and their allocations will be pretty generous as well. But for those of us who have no political connections (the 99%), what could we expect? Thanks to the current (but temporary) tight oil revolution, it might not be as bad as it would have been a few years ago. But I suspect that penciling in the numbers would be a pretty grim task. I wonder how people would react should families be rationed to perhaps one or even a couple of gallons a day. Even with the recent increase in production from tight oil, there is a huge gap between domestic production and consumption. I've not even touched on what the price of rationed gasoline (or diesel) might be. A black market would surely emerge and the black market price would be astronomical. The authorities might rage about the black market but they could not stop it. I do not even want to think about what happens to commuter cities such as Los Angeles or Houston, to mention just two. They lack mass transportation. I've thought about rationing for many years, and written some (what looks like crazy to conventional thought) projections on what could happen if fuel becomes very costly or rationed. I believe (based on human response to real sustained shortages), people would get very creative. I recall the story of the isolated town (apocryphal, perhaps) that lost its generator. Residents quickly cut their electrical usage in half without any regulations. I know I appear like a bicycle fanatic to most because I bike almost as many miles as I drive, but given that most car trips are less than 5 miles, bikes are a potential alternative in non-extreme weather. Ditto car pools, min-vans, etc. A HUGE percentage of fuel is wasted in the US (on business travel, sitting in traffic, 1-passenger vehicles, low-mileage vehicles, etc.) Rationing would provide significant incentives to eliminate waste, and people tend to respond in ways that serve their self-interests. It might be a positive thing after the initial shock that we have to change wears off. There is some rationing by price now, but it is grossly unfair. If the stockbroker had to bargain with the homeless man for fuel coupons so he could fill up his Beemer, that would be a first step toward fixing things. But there would still be a very long way to go, and I don't see how we are going to get there. In the last place I worked, some employees drove more than 100 miles one way every day. One drove more than 150 miles. Often it was because the wife didn't want to move to where the work was. When fuel shortages put an end to these long commutes, modern industrial civilization will disappear, because it will not be possible to rearrange things fast enough. If we had listened to Edison, Hubbert and others, we could have avoided this looming disaster. Who'd have thought that Zimbabwe could teach us so much? For those of us who lived there it showed what life could be like under hyperinflationary conditions, and under fuel rationing conditions. I'm sure Arthur could probably also regale you with stories of using restrictive fuel rationing coupons from circa 1978. I suspect that people are unaware of the true impact which consumer fuel rationing could have on their everyday lives. Blinkers begin to attach themselves to one's daily routine. "At what time should I leave my car parked in the 3-day fuel queue? ", "Whose turn is it to take the 6 neighbours to work in their car this month? ", "At what time do I have to return to my parked car in 3 days' time so that I can progress up the queue to the fuel pump, fill up, and still get to the supermarket afterwards before they shut, so that I can do my fortnightly grocery shopping and feed the kids? ", "Which is the best & shortest route to drive so that I can travel along as many roads as possible on a downhill gradient? ", "Which larger refrigerator should I buy so that I can store 2 weeks' worth of groceries at a time, now that I can't drive to the shops more regularly?" In Zimbabwe the above typical daily preoccupations applied equally to fuel, ATM queues and to food. Try coordinating all of these scenarios simultaneously around your life and your job! Main Street will be forced into this kind of pattern should fuel become severely and suddenly rationed. It makes experts of us as logisticians, but it potentially narrows intellectual scope, and leaves little room for social pursuits and relaxation. On the face of it it seems subtle, but its ancillary effects on our time and our lives is huge. Charles, a very interesting speculation! The image of the US as the sole remaining superpower is also still strong. For instance, the feeling is that we need our hugely expensive and expansive military to "keep the global peace". (Or, as David Graeber points out, to ensure that the US dollar remains globally accepted as the reserve currency.) A move toward autarky would threaten a variety of global interests, with multiple consequences, and would surely be resisted by the global network of finance and industrial powers. On the other hand, there's also a growing awareness, in the US and elsewhere, of the need to move to a lifestyle roughly like autarky; this is being manifested more by local thought and action than in national policy. Could autarky happen bottom-up, as the national fantasy cracks and crumbles? I was looking at those charts and they didn't seem to ring true. 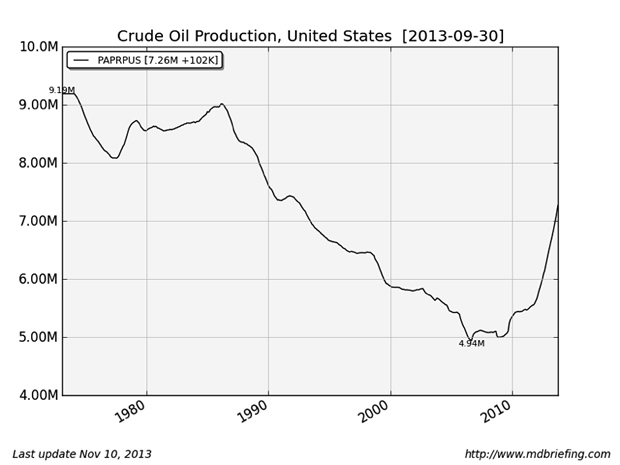 If net imports are about 6.5 mbpd and domestic production is about 7.5 mbpd, that means the US uses about 14 mbpd. I'd heard that it was over 18 mbpd. Which is right? 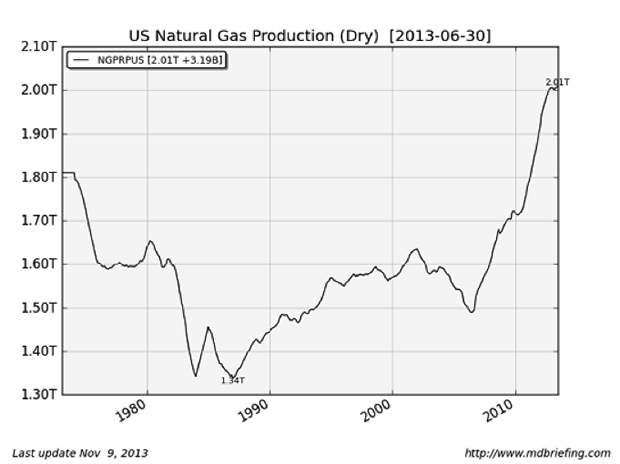 The dry gas production graph looks very different from the EIA graph, but I see that the latter is zero based, so the slope up to 2012 looks very gentle, compared with the one here, otherwise they seem to show similar numbers. The EIA graph is also showing more recent data and shows a plateau for the last 12 months or more (presumably because fracking is not very profitable - if profitable at all - right now). I couldn't quite work out the vehicle miles graph. It seems to be a graph of the percent increase over January 1971 of per-capita vehicle miles per period (not sure about the period but I guess that's not too important on this graph). So it doesn't quite give the full picture of how total vehicle miles driven has varied, since the total is, presumably, more important than the per-capita? Thankfully our globe has a series of different land masses, and the advantage of this is we can borrow $$ from folks in the other land masses. Imagine how terrible it would be if there was only ONE landmass on the globe, and only ONE country. I can tell you right now, that their economy would be down the tubes, there would be mass poverty, very little infrastructure, etc. Why you ask? Simply because as there is only one country, it means that they cannot lend money off other countries in order to improve their own circumstances, and without this ability to lend $$ from other countries, yep, sorry to say, but their economy will be right down the tubes. Sofistek, the energy charts were prepared by PP.com contributor Davefairtex from raw data from govt agencies (EIA, I believe). Since the miles-driven were population adjusted, they are roughly comparable to per capita measures. I think we're driving fewer miles per capita, and using less fuel to do so, hence a significant decline in consumption from 2008 peaks. Although I didn't discuss this in this first series (which was already long enough), autarky strikes me as scale-invariant, meaning some communities will become more self-sufficient and rely less on other parts of North America. Perhaps the same will be true of regions and states. Any shift in relative dependency has the potential to upset the status quo, which is why it's such an interesting topic. China would be impacted if manufacturing shifted to the Americas again, and if a global depression cut imports from Asia. The mideast is already being impacted by the relative reduction in OPEC's share of the global oil market. But the US also has an interest in maintaining energy for its allies, so I doubt the US would lose interest in oil exporters even if it were to (briefly) become oil independent. But if the global economy contracts in a new financial crisis, as many of us expect, the desire to protect home markets and production could spur trends to autarky that would severely disrupt economies that are heavily dependent on exports--China, Germany, oil exporters, etc. 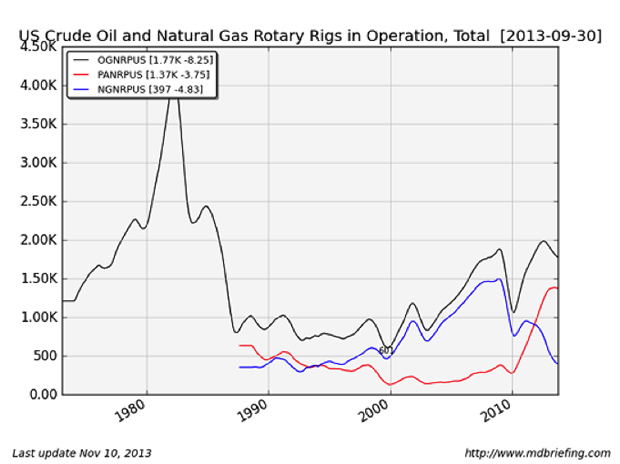 Yes, any increase in energy production domestically has a short shelf life. But as noted above, I see the potential cut energy consumption in half without major sacrifice. As others noted, price imposes its own rationing at some point. Right now, that looks distant. Most interesting comments on the impact of rationing--either by central planning or price. the web could enable a much more efficient use of resources, I think, as the logistics could be largely automated. Thanks for the response, Charles. 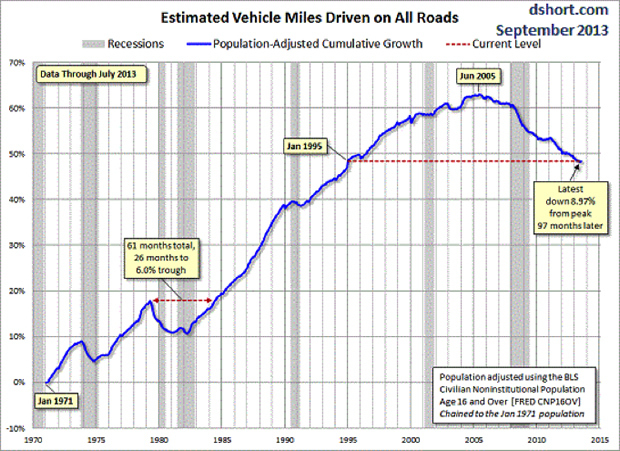 I'm still not sure about that vehicle miles driven chart as we have to just assume that the total vehicle miles driven (not per capita) shows a similar drop, but without the data. 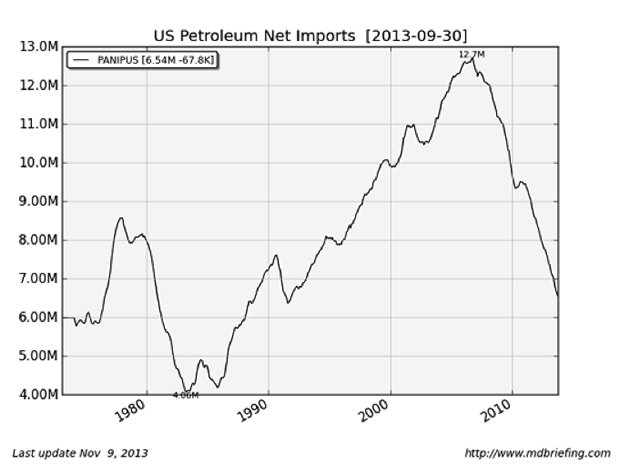 You didn't mention my point about the charts of net oil imports and domestic production. The combined net imports and domestic production show a much lower total than I'd thought the US was using but the discrepancy may be because the total consumption includes stuff other than crude oil (e.g. natural gas plant liquids, biofuels, refinery gains). I'm not sure that autarky is scale independent. That might be true up to a point if a country is large and have plentiful usable land but, for example, could the UK be self-sufficient with 64 million people? No doubt large decreases in energy use could be made without much sacrifice, provided it is done through efficiency measures. However, it would affect energy producers, who would sell only half (in your example) the energy they do now (until economic growth or the rebound effect, spurs greater use), so that would definitely affect those employed by energy companies, directly or indirectly. Consequently, I don't think it's possible to significantly reduce energy consumption painlessly, though it must be done. I am not sure about the data discrepancy and can think of a few possibilities but will have to look deeper at the standard sources. You make an interesting point about scale invariance, and I would say that with a diet much lower on the food chain than it is currently accustomed to, the UK could probably feed its people. If the rule of thumb is correct, 5-10 lbs of grain = 1 lb. of meat, then a significant reduction in meat consumption would greatly increase the calories available for humans. Land that could be productive but not at a corporate profit (for example, home gardens, urban gardens) could boost food production by as much as 30%, if other nations are any guide. None of this makes sense as long as oil is cheap and grain surpluses are plentiful. I think another topic of interest is regional autarky. Some areas in the US have plenty of water, soil etc., others do not. Will that eventually matter? I don't know, but relative abundance of necessities may act as attractors to people who can choose where to live. The jobs in energy might rise as it takes more capital/labor to extract the same quantity of net energy. For example, there is a lot of oil in old wells in the US but it takes a lot of capital and labor to install technologies to extract it. If oil stays at $150+ a barrel, a lot of old wells become good prospects for new investment, even though they typically yield trickles of oil (50-60 barrels a day, for example). Interesting chart. I recall when I was a kid, gas was 25 cents a gallon or less. 2000, it was CPI adjusted, about the same price. As a high school kid, I would drive around in circles all night, as would my friends, usually on $1 worth of fuel. A kid can't do that today, unless his mama and daddy give him plenty of money. Long trips in small cars also isn't a joy ride, so I suspect those have gone away for many families. the price mechanism has had its effect. You might also recall that big SUV's and other large auto's were in vogue 10 years ago. $100 fill ups changed that. The size of an empire is dependent on it's speed of communication. Max Keyser discusses TTIP, a Super-National trade organization that can sue your elected Government if they make laws that interfere with Big Business. This is an attempt to impose order on a chaotic system. A top down centralist government, if you will. Destructive harmonies will shatter all illusionary mental constructs that they create.